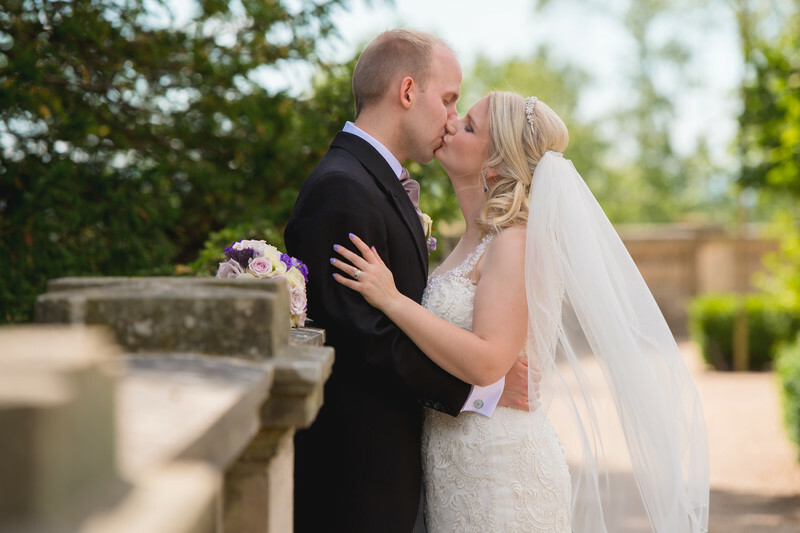 A bride and groom kiss after their wedding at the Wood Norton Hotel in Evesham. The Wood Norton Hotel in Worcestershire is one of my favourite wedding venues, and a wedding venue that I am a recommended supplier for which is great! The hotel itself has so many different areas for wedding photography, as a photographer you're almost spoiled for choice. One of my favourite locations is this bit of garden, with a tree lined alley way leading from the side of the hotel right to the front of the lawn. 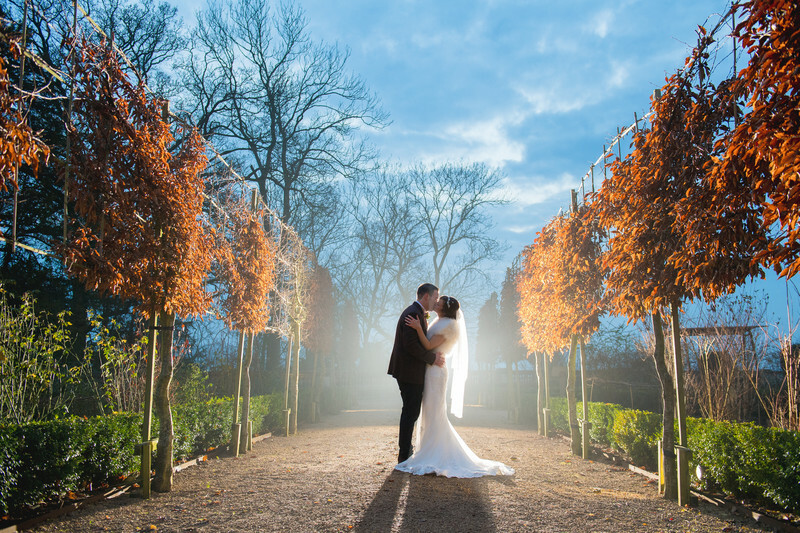 I actually came about this style of photo at the Wood Norton when a winter wedding I was photographing had the weather close in dramatically as I was taking photos. This is the photo in question. As you can see from the colour of the trees and how dark it is (considering this image was taken at only 3pm in the afternoon) it's easy to see it's a winter wedding. We were taking photos in the grounds when suddenly the weather turned and fog started to blow in. All of the wedding guests were moved to the Orangery, a stunning dual aspect glass fronted building that the Wood Norton use for wedding receptions. This left just myself and the bride and groom who were hanging back in order that they could be announced into the wedding breakfast in traditional style. As soon as the fog started blowing in though, I knew that we had to at least attempt this image. I placed a flashlight behind the bride and groom on a small light stand, and pointed it back towards the camera. The ambient light levels was rapidly falling and the fog was getting worse and worse, so we only had a few minutes to nail the photo. I set the flash manually and guessed the camera settings. This was actually the first photo I took, which turned out to be my favourite from the set. David and Laura's wedding (the main image) was a different story however. 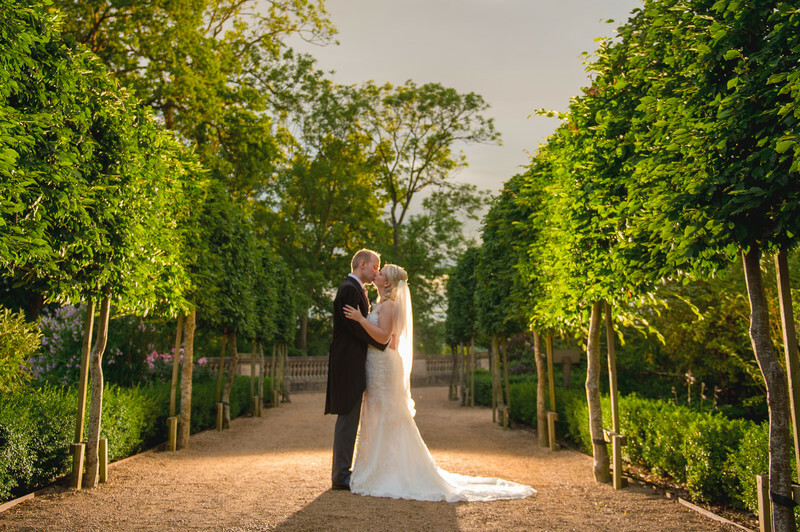 It was the middle of summer, there was a little rain in the evening but there certainly wasn't any fog and it was a long way from the 3 degrees centigrade that it was for Emilie and John's winter wedding! For David and Laura's Wood Norton wedding, we almost had the opposite problem. The summer sun was so bright, we had to take a lot of photos in open shade in order to balance the contrast of a white wedding dress and a black groom's suit. It wasn't until much later in the evening when the weather did eventually turn on us, and it was after the wedding breakfast that we decided to try the image that's the feature of this article. This time the sky was naturally growing dark as the sun was sinking below the horizon, but the way in which the image was taken was identical - apart from the panic that we only had seconds to pull it off! I am one of only three recommended wedding photographer for the Wood Norton Hotel. To view the Wood Norton Hotel's wedding website, please click here. Location: Wood Norton Hotel, Evesham.